Now for the Dad Olympics! HOW much of yourself do you have to give to attain the level of greatness we saw in this summer's Olympics? How do you learn your chosen sport? You educate yourself and train as hard as you possibly can. Surely that is the key to achieving anything: education and practice. It's how I Learned the trade which earns my living; how I learned to play music when I was at high school. Before I go any further, let me introduce myself. I'm Mark, husband to Caroline and daddy to Mara who is now six months old. I'm also a blogger who has been documenting our lives since we found out we were expecting last summer. Because you don't become a dad when your child is born, you become a dad as soon as your partner tells you she's pregnant! Caroline spent a lot of time sleeping in her first trimester, I began to write and this is how my blog, Thoughts Of A First Time Dad, was born. Then Mara rocketed into our lives two months early, just before we were due to commence our antenatal classes, so the Dads2b course I had attended a matter of weeks before was really a blessing! I was first made aware of the class after an early visit to our midwife for a check up. I emailed one of the co-ordinators and signed myself up for four weeks of training. Fast forward a few months and there I am, sitting in a room in St Johns Hospital, Livingston, with 10 other guys from around West Lothian. Dads2B was organised by Andie Hewitt (Parent Education Co-ordinator, NHS Lothian) and Stephen Gorman (Early Years Development Worker, West Lothian Council - Sure Start) to help expectant fathers in the West Lothian district (and recently expanded into Edinburgh) step up and be the best fathers they can possibly be by participating in a hands-on, dads only, antenatal class. There is so much to learn over the four weeks, I wonder if I would have been able to cope if I hadn't taken part. 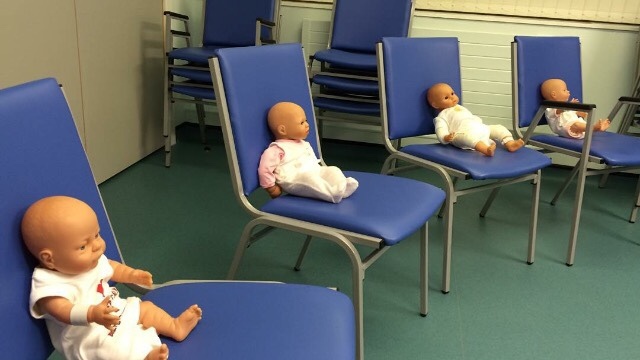 Looking back now, it was incredibly funny at times to be part of a group of grown men changing nappies on dolls and pretending to bathe them with looks of sheer determination on their faces, but it was totally worth it in the end. Also, usually on the last week, one or more dads who have previously completed the course come back and share their stories of their little ones' birth and how life has changed for them and their family since. It was during one of these visits that I picked up some valuable information which helped Caroline and I out no end when Mara was born eight weeks early. During the labour (which had been happening for 3 days and we had no idea) I was pacing around the labour suite reading a book on breathing exercises as we hadn't yet attended our couples antenatal class together! Anyway, after five weeks in the Special Care Baby Unit (SCBU) and a few more weeks at home adjusting to our new lives, I went back to the Dads2B class with Mara to regale the new batch of expectant fathers with our story and also to put the fear of God into some of them! Going back to class is also how I became aware of Year Of The Dad. When we came home that night, I immediately went online to this Year of the Dad website and was amazed by what they are trying to achieve! As you'll see from browsing this site, the aim is to spend 2016 (and beyond) focusing on "embracing the potential of fathers and father figures, promoting their importance in child development and supporting them to be the dads they want to be." There is a wealth of information available from why they are choosing to highlight dads, upcoming events around the country, a directory of dad-friendly groups and organisations across Scotland, stories from dads who have done things differently and all you need to know about paternity leave at work, amongst other things. Thanks Year Of The Dad for giving me the opportunity to write for you, its been an honour! I'm happy to be working alongside YOTD and promoting them through my blog and Facebook page. You can also follow my progress on Instagram or Google+. If anyone has questions, about becoming a new dad or anything else then please get in touch! And thanks for reading! Read another Dad's experience of Dads2b after three children!